Etsy is a haven for all things homemade, and a superb resource for weddings. Whether you're not inclined to sew your own birdcage veil, are searching for a vintage cake topper or want the perfect pair of Lynyrd Skynard cuff links for your groom to sport on the Big Day, Etsy is the place where all your dreams come true. 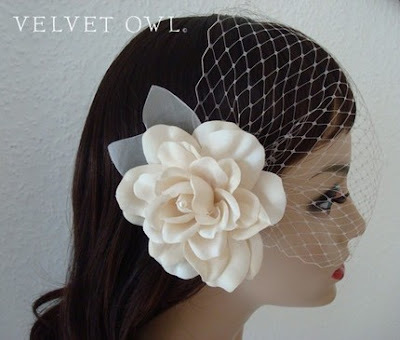 This gorgeous gardenia fabric flower and birdcage veil is from Etsy seller Velvet Owl, and it sold between yesterday afternoon and this morning! She does superbly beautiful things, especially with feathers, for a wedding look that's dramatic without looking like you put a bird on your head.